The man who really put the reverse into swing. 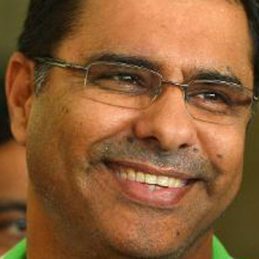 Waqar Younis bucked the 1980s trend of pitching fast and short by pitching fast and full. Not an obvious recipe for success until you factor in prodigious late inswing, which was designed to smash into the base of leg stump or the batsman’s toes. In his youth, he was one of the fastest ever. Waqar’s surging run was a glorious sight – and an incredible strain on his body. His method of aiming for the stumps rather than the batsman earned him the best strike rate of any bowler with over 200 Test wickets, till Dale Steyn came along. It could have been better: back injuries cut short his prime, but determination has always resurrected him, although he was easily pushed over the line that divides aggression and intimidation. He looked to have been put out to pasture by the end of 2000, but before long he had been appointed captain for the 2001 tour to England. Initial results suggested that this was an inspired move, but in October 2002 he was at the helm as Pakistan crumbled to 59 and 53 all out against Australia in Sharjah. He managed to retain the job for the World Cup, but a disastrous tournament – Pakistan beat only Holland and Namibia – meant an unceremonious exit. Unable to force his way back into a side building for the future, he announced his retirement in April 2004. As a batsman, lusty blows were his staple, but Waqar batted with the air of a man who thinks he could have done better. The next stage of his career began in March 2006, when he was appointed Pakistan’s bowling coach, and he also became a regular in the commentary box. In March 2010 he became head coach of Pakistan, a job he handled till August 2011. While Pakistan were embroiled in several off-field controversies during that period – the spot-fixing scandal in England and Zulqarnain Haider fleeing to the UK happened during those 18 months – the on-field results were pretty good: Pakistan drew a Test series in South Africa, won in New Zealand, and reached the semi-final of the 2011 World Cup. He was later shortlisted as one of the candidates for Australia’s bowling coach, while he also had a short coaching stint in the BPL, but his next high-profile assignment came in May 2014, when he returned as Pakistan’s coach for a second term.